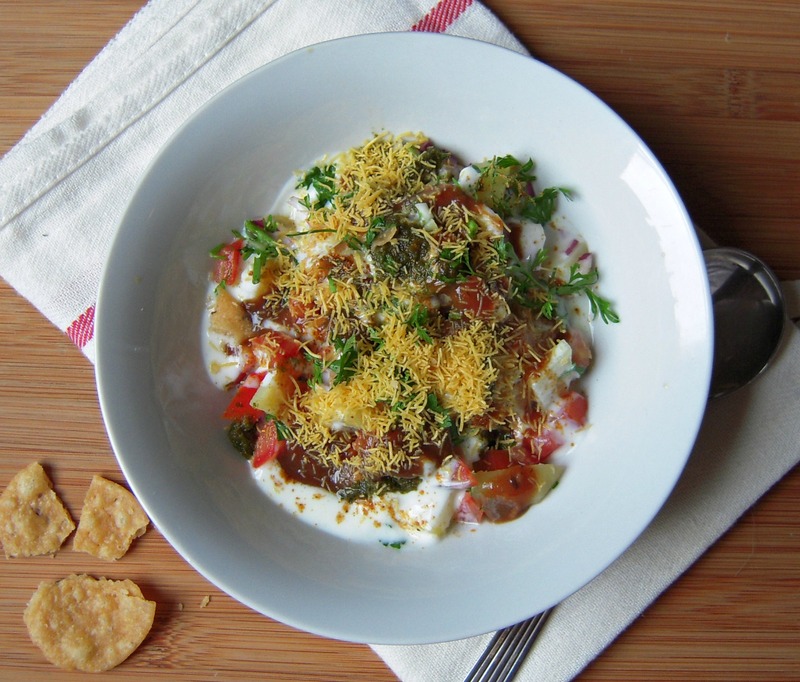 Papdi Chaat is one of the famous Indian street foods. Crispy Papdis are topped with chopped veggies like tomato, onion, boiled potatoes, sweetened yoghurt, tamarind chutney, green chutney, chaat masala, and is liberally garnished with nylon sev. It is one of my favourite Indian street foods too. When the weather is dull and gloomy, a plate of this crunchy, spicy delicacy can do all to make your day and perk your mood. Most of the time I have papdis made well in advance. They can be stored and keep well for a month or so and as in most Indian households, I always have a jar of tamarind chutney and green chutney in my fridge. With these things readily available, making 'Papdi Chaat' is just a matter of chopping some veggies and assembling them. It can be made in under 10 minutes. 1/2 cup yoghurt beaten with 1/4 cup water, salt and sugar to taste. 1.Peel the potatoes and dice them into small pieces. Keep them in a bowl and drizzle lemon juice over it. 2. Chop tomatoes and onions into small pieces. 3. Arrange the papdi on a large plate. Place a teaspoon of potato over each papdi. Then add a teaspoon of chopped tomatoes and onions. 4. Drizzle 2 teaspoons of yoghurt on each papdi. Sprinkle a pinch of chat masala and add teaspoon tamarind chutney and half a teaspoon of coriander chutney. Sprinkle sev over it and chopped coriander over it. Devour one papdi at a time... Ah, Bliss! If you think that is too much of work, then crush the papdis and place them on a plate and heap all the ingredients over it one by one! It won't look that beautiful, but I tell you it is as delicious as the other one! My DH likes it this way while I prefer to have it the other way. Linking it to Priya's Olympics Games Event. 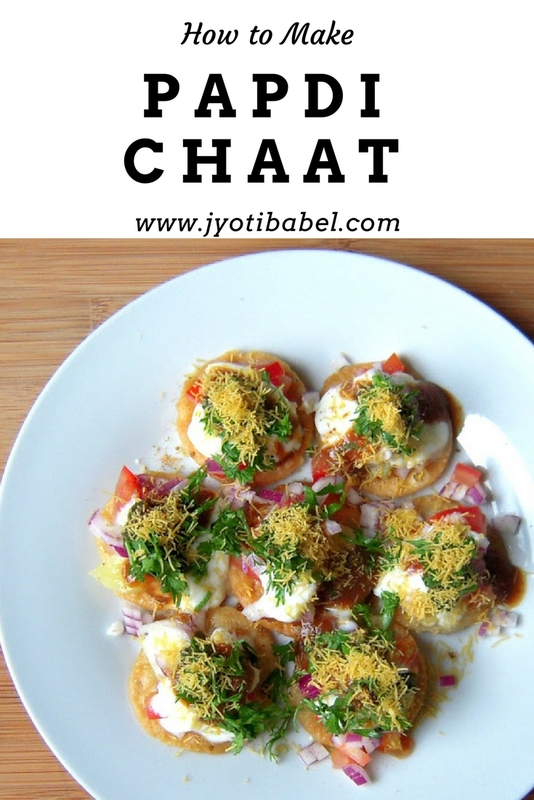 Mouthwatering here, wat a terrific and super tempting papdi chaat, thanks for sending. So So tempting!!!!! i m craving for these now!!!!! To be honest, this is my fav. Whenever I go to Ramkrishna (the local veg hotel) I have this. The yogurt in it does the trick I suppose. yummyyy! what lovely pictures :P ... i want!! hi hi akele akele...woh bhi papdi chaat? :-) I must visit you !! Mouthwatering papdi chaat! I love it! First time here...you share beautiful page Jyoti. Happy to follow you. Love the pics...Glad to follow you do visit my space in ur free time.